Our field-work aims to determine how much growth and mortality of plankton contribute to the formation of plankton patches, their persistence, and decline. 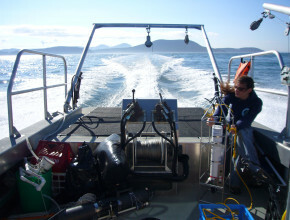 The experiments are mostly done in a shallow, coastal fjord (East Sound, Orcas Island, Washington), and supplemented with seasonal studies in Narragansett Bay, Rhode Island. 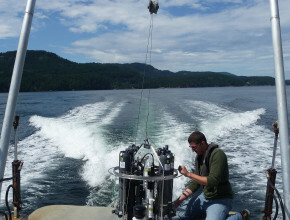 Combining frequent small-boat surveys with laboratory measurements, we concurrently quantify the physical, chemical, and biological parameters associated with patch occurrence and dissipation at biologically meaningful resolution (meters and days). This research provides insight into the coupling of small-scale biological and physical processes, and their contribution to larger-scale phenomena. Moreover, this project provides fascinating opportunities to investigate the role of spatial scale and heterogeneity on plankton population dynamics. Menden-Deuer 2008; Menden-Deuer & Fredrickson 2010; Menden-Deuer et al. 2010; Lawrence & Menden-Deuer, 2012; Menden-Deuer, 2012.